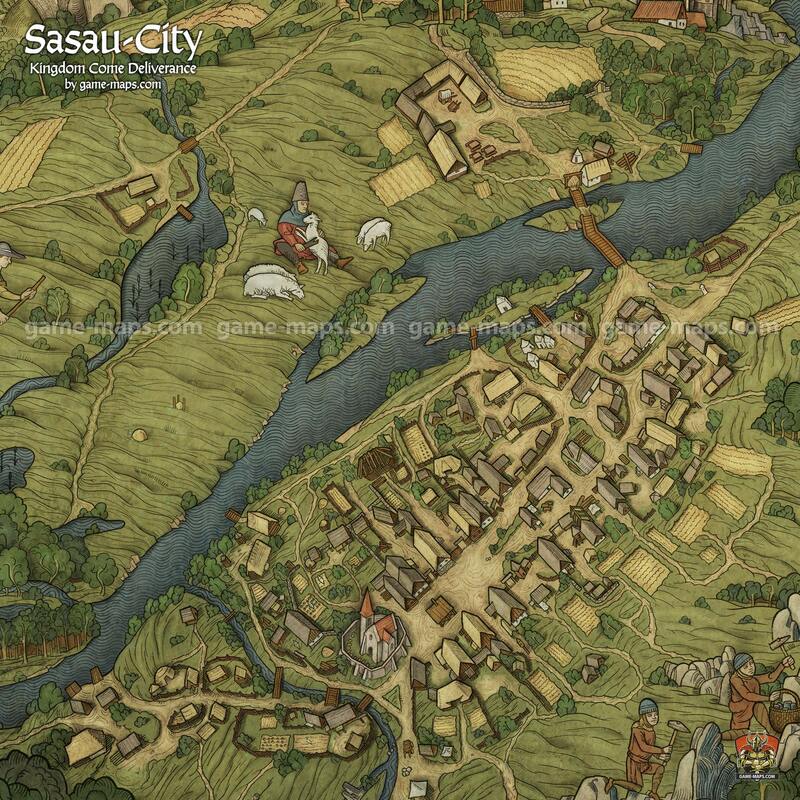 Map of Sasau City in Kingdom Come Deliverance KCD Video Game. Originally, Sasau was a settlement on the left bank of the river, opposite the monastery. For over a hundred years the town was the property of the Benedictine monastery. Houses were centred around the Church of St. Martin and along the road to Prague and Kouřim. During the Hussite Wars, the monastery and its surroundings fell into the hands of the Hussites and building work ceased until the mid-17th century, but the monastery survived. For more than 200 years, after the monks were expelled, the monastery lands belonged to the local aristocracy. The parish church of St. Martin was founded on the left bank of the Sázava River in the middle of a small town in the 14th century. It is a single-nave structure with a chancel, a tower on the north side and chapel on the south. The entire complex is enclosed by a high graveyard wall that has survived to this day. During the Hussite wars, the Hussite preacher gave sermons in Czech. Only the tower windows have been preserved from the original building.